Vomiting and diarrhea lead to loss of water and mineral salts. To compensate for it and avoid dehydration, drink a lot, at least 2 liters of drink a day (water preferably flat water rich in sodium, broth of salty vegetables, sweet herbal teas …). You can add some sugar to the water, especially for children, or drink sugary drinks such as sodas as long as you stir for long enough to remove all the gas. Avoid soft drinks that can promote bloating, fruit juice, and of course alcoholic beverages that promote dehydration. The first few days, it is often challenging to eat properly but always try to eat a little. As soon as you start eating a little more, it is recommended to make several small meals during the day. Crackers spread with honey or fruit jelly. Avoid all excesses within three days of the episode of gastroenteritis. Once the digestive symptoms decline, you can gradually resume your normal diet. To prevent contamination though sanitation measures(keeping your food and hands clean). To avoid dehydration (drink plenty of water. To reduce the intensity and the duration of diarrhea. Antibiotics are indicated only in case of proven invasive bacterial infection. When Should I talk to a health professional? 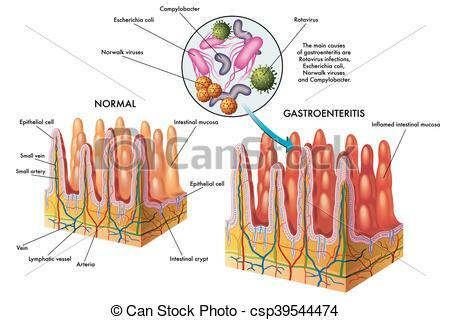 Acute diarrhea is usually benign and occurs during epidemic periods of viral gastroenteritis. However, they are possible throughout the year and can also be caused by food (food poisoning) or by certain drugs. Excluding cases of excessive diarrhea with signs of bacterial invasion (fever, deterioration of general condition), severe vomiting preventing oral rehydration and frail or at-risk persons (infants, especially before older people, patients with certain chronic diseases), three therapeutic measures are usually sufficient to overcome the problem. Protect the patient and his environment from additional gastroenteritis or contamination. The re-infestation of the patient and the contamination of his surroundings need to be avoided by cleaning and hygiene measures. It is important to keep the patient and their area: wash hands after each evacuation and before meals, avoid sharing toiletries and cutlery, disinfecting toilets and washbasins. These simple measures are often not implemented. The essential measure is to restore fluid and sodium losses, as significant losses of these elements can have serious consequences, especially in children and the elderly. Therefore, dehydration should be stopped or limited. Dehydration can be corrected orally by consuming fluids or by IV. Intravenous medications – Approximately, the volume of fluid that is displaced must be replaced from the suddenly lost from diarrhea. For adults, who have to drink more than usual, (typically more than two liters per day) you can add drinks containing sugar and salt to compensate for losses, in the form of sugar water, herbal teas, mineral water, vegetable broths. Sometimes recommended, Coca-Cola can quench thirst and bring sugar levels back up, however, will not contain salt. Also, the gas must be removed before drinking. It is best to drink often and in small amounts, especially if there is nausea or vomiting associated. In this case, ingestion of sugar is essential to prevent ketosis (lack of sugar) because of fasting. If necessary, a medicine against nausea and vomiting can be taken with the advice of your pharmacist or doctor respecting the doses and duration of treatment. Sub-lingual forms are preferable because they do not need to be swallowed to make an effect. If there is a fever, it is usually moderate and disappears spontaneously. Optionally, an antipyretic drug can be taken. On the food side, you should prefer salty, sugar-free, and residue-free foods such as pasta, rice, cooked carrots, and crackers. Raw fruits and vegetables, as well as frozen drinks, should be avoided. Again, small amounts should be taken at short intervals until symptoms improve and tolerance to a normal diet is restored. They reduce intestinal contractions and reduce the number and frequency of bowel movements. The most commonly used is loperamide, which, like all drugs, is necessary to respect the doses and duration of the treatment. Antisecretory drugs such as racecadotril (Tiorfan) are also useful. Note that these transit retarders should not be taken in case of ulcerative colitis, ileocolitis or if your doctor advises you not to slow the transit. These medications should not be used for bowel stenosis (narrowing) or dilation of the colon, or for people who are bedridden or have reduced physical activity. Sometimes antispasmodics such as phosphoglycerol sub-lingual (Spasfon Lyoc) or an analgesic(paracetamol)can be used to relieve spasm and pain. Other medications that can be used are Lactobacillus acidophilus to help restore the intestinal flora or even intestinal antibacterials such as nifuroxazide but the interest of these is limited in France. Finally, phytotherapy or homeopathy treatments are also used in short courses. 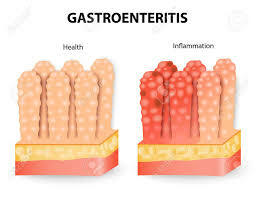 Gastroenteritis: when to consult A doctor? Persistence or aggravated of symptoms lasting longer than two 2 of treatment by you. If you have dry mouth and very thirsty (signs of dehydration), or if you have a sudden loss of weight, 2 Kg or more. In case of excessive diarrhea and/or uncontrolled vomiting, bloody or sluggish diarrhea, high fever, malaise and/or severe abdominal pain (risk of invasive bacterial infection which will require appropriate antibiotic treatment, most often at the hospital). If you return from a trip to a tropical country or with poor sanitation. If diarrhea occurs during or just after antibiotic treatment. If diarrhea comes back more or less regularly by episodes. If you have a heart valve disease or a condition or treatment that decreases your defenses (HIV infection, cancer, corticosteroid treatment, chemotherapy …). Overall, it is advisable to talk with physician for any child aged two years or less with acute diarrhea/gastroenteritis, with or without vomiting. He/She will then tell you, based on the symptoms, the context and his state of hydration or the child’s tolerance to food if you can try oral rehydration at home with the help of rehydration sachets. As for the adult, the doctor’s visit should be done quickly if there is the presence of blood or mucus in the stool, high fever, deterioration of the general state or apathy, signs of dehydration (absence of tears, decreased urine excretion, which will require intravenous rehydration in the hospital. Like the toddler, the elderly are less sensitive to the sensation of thirst and may not spontaneously show the need for water supplementation in case of diarrhea. If the person is being monitored and shows no evidence of dehydration, excessive diarrhea, severe vomiting or signs of bacterial diarrhea, rehydration of 1-2 liters of saline water may be attempted, alternating with natural water to avoid salt overload. At the slightest suspicion, you need to consult your doctor quickly.